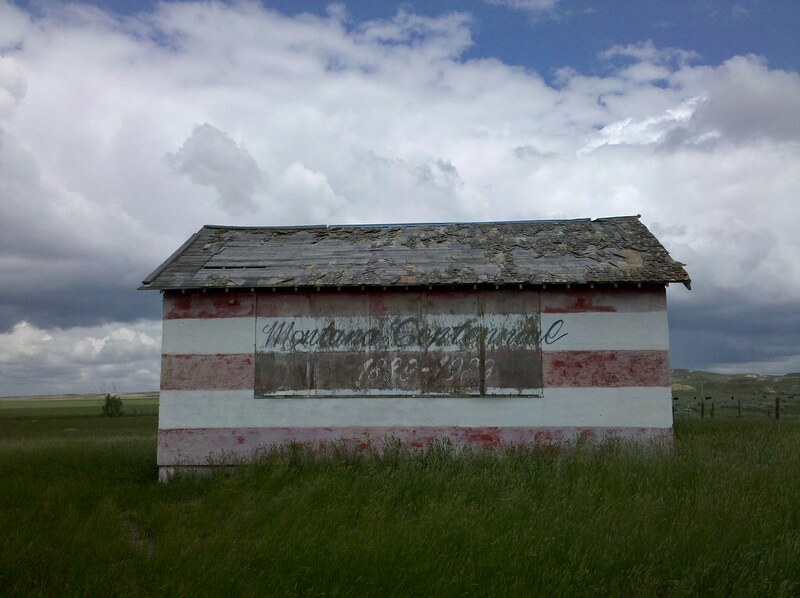 Whoo… That barn may not make it to the next Montana Centennial. This is not a barn. It was a school house. My mother went to that many years ago. You are just few miles from I grew up. I’ve been following your progress with great interest! I took a photo of that same building in 1977. I’ms so happy to see that it’s still there, and still painted red, white and blue. Looks like it’s time for another 100-year roof. How smart is Matt??? Really , really, really smart!!!! Why Today 7/6/10 in New York City the temperature was 99 degrees. Circle Montana where he is headed 66 degrees–tomorrow 76 degrees.!!!!! Way to go Matt. Next year I think Jeff- from Jersey and Matt should walk across the so. 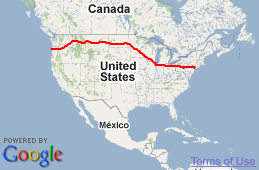 part of the country!!!!! Hay I heard that….Ok…I am on. If Matt is game (not the hunted kind). Today it reached 105 here where I am..I walked around 4am…it was 78 then. I agree with the way Matt seems to have planned this out. Ive been checking the weather his way too….I am impressed. If I was 29 again…realy I would do this in a heartbeat after being educated by Matt’s journey. Hopefully he will start up the New York City walks again…I would be on for that. Heck I would settle for just shaking Matt’s hand and saying ..thanks. Thanks for everything. You’re sick you know that Jeff? I think you’ve been in the heat to long and have heat stroke. You ENJOY the heat??!! Man you are some sort of crazy(in a good way though. all said in fun). thanks and I respect your comments. I get it all the time. I am crazy at times – but never popular enough to be class clown. Stay cool. As I hope the Walker is right now. oops…I’ve logged on as Jef with one F…..two few beers… Debbie – work on him for a book. He has a journal, he has AMAZING pictures…..and a loyal fan backing to boot. Ha ha, “Jef,” I thought that was you, Jeff (from Joisey). I’d know your “voice” anywhere. Too few beers is right! With the brutal heat wave over here, we need our brewskis even more, if one actually “needs” beer. naa only had one. I promise. Maybe we could get some STIMULUS MONEY (only 43% has been spent) and get China to send some lead paint so that this beauty could be spruced up. Lets work on this project as a part of the HOBO NATION!!! SOOOOO-PATRIOTIC!!! Howdy from Don in Tennessee-Home of the VOLS and The Great Smoky Mountains National Park!!! Hi, Don. That’s a beautiful area where you live. It’s been a long time since I’ve been down there. Don, I have flown into Nashville, Stayed in Cookeville and spent a long evening on a houseboat in a power generator dammed up lake. I send my gretting to you too. In Tennesse I learned what a “shotgun house” was, I learned to enjoy staring at the sky and watching the stars and planes….and I had to ask…what the heck is a “Vol”. I know why you are proud of your home state. I am talking about the University of Tennessee Volunteers (VOLS). College football is a big deal here in the South! Pro sports are a distant second around here. Cookeville is halfway between Nashville and Maryville where I live. Maryville is about 18 miles from Knoxville. About half of the county (Blount) is in the National Park. My house backs up to a second generation 100 acre farm (plenty of corn growing) and on a good clear day I can see Mount LeConte in the Great Smoky Mountains. In the fall we see calves born and we get to see donkeys, horses and coyotes (the donkeys keep the coyoytes at bay). Stay cool and if you wat to e-mail to cut down on this site clutter do so at watson50@charter.net! Look forward to hearing from you or other HOBO NATION TRIBESMEN AND TRIBESWOMEM! That sign seems to say 1889-1989. If so, I wonder why it was painted like that in 1977 when The Dakota Kid took his picture. They must plan well in advance in Montana. Perhaps the Montana Centennial was added later at the correct time “over the red & white”. I’ll bet the barn was painted red, white and blue for the nation’s bicentennial in 1976, with the state’s centennial added later. Trust me on this one – mom’s are always right. My daddy told me so.